Recently, I was reading Todd Hoff’s write-up on FaceBook real time analytics system . As usual, Todd did an excellent job in summarizing this video from Engineering Manager at Facebook Alex Himel, Engineering Manager at Facebook. In this post, I’d like to summarize the case study, and consider some things that weren’t mentioned in the summaries. This will lead to an architecture for realtime analytics of large datasets that might be easier to implement, using Facebook’s experience as a starting point and guide. The main drive for many of the innovations around realtime analytics has to do with competitiveness and cost, just as with most other advances. For example, during the past few years financial organizations realized that inter-day risk analysis of their customers’ portfolios translated to increased profit as they could react faster to profit and loss events. The same applies to many of the online ecommerce and social sites. Knowing what your users are doing on your site in real time and matching what they do with more targeted information transforms into better conversion rate and better user satisfaction, which means more money in the end. Content producers can see what people like, which will enable content producers to generate more of what people like, which raises the content quality of the web, which gives users a better Facebook experience. The massive transition to online and social applications makes it possible to track user patterns like never before. The correlation between the quality of data that providers track and their business success is closely related: for example, e-commerce customers want to know what their friends think about products or services, right in the middle of their shopping experience. If sites cannot keep up with their thousands of users in real-time, they can lose their customers to sites that can. So while risk analytics in financial industry was still a fairly small niche of the analytics market the demand for real time analytics in Social, eCommrce and SaaS applications brought the demand for real time analytics to main-stream business under massive load. No one has time for batch processing anymore. Newer infrastructures and technologies like tera-scale memory, nosql, parallel processing platforms, and cloud computing, provide new ways to process massive amount of data in shorter time and with lower cost. As most of the current analytics systems weren’t built to take advantage of these new technologies and capabilities, they haven’t been able to adopt to real time requirements without massive changes. One of the hottest trends in the analytics space is the use of Hadoop as almost the de-facto standard for many of the batch processing analytics application. While Hadoop (and Map/Reduce in general) does a pretty good job in processing massive logs and data through parallel batch processing, it wasn’t designed to serve the real time part of the business. Strong evidence for that can be seen from the moves of those who were known as the “poster children” for Map/Reduce: Google and Yahoo both moved away from Map/Reduce. Google has moved to Google Percolator for its indexing service. Yahoo came-up with a new service S4 which was designed specifically for real time processing. Hadoop/Hive..Not realtime. Many dependencies. Lots of points of failure. Complicated system. Not dependable enough to hit realtime goals. According Todd, Facebook evaluated a fairly long list of alternatives including as MySQL, an in-memory cache, Hadoop Hive/Map Reduce. I highly recommend reading the full details from Todd’s post . Every user activity triggers an asynchronous event, through AJAX – this event is logged in a tail log using Scribe. Ptail is used to aggregate the different individual logs into a consolidated stream. 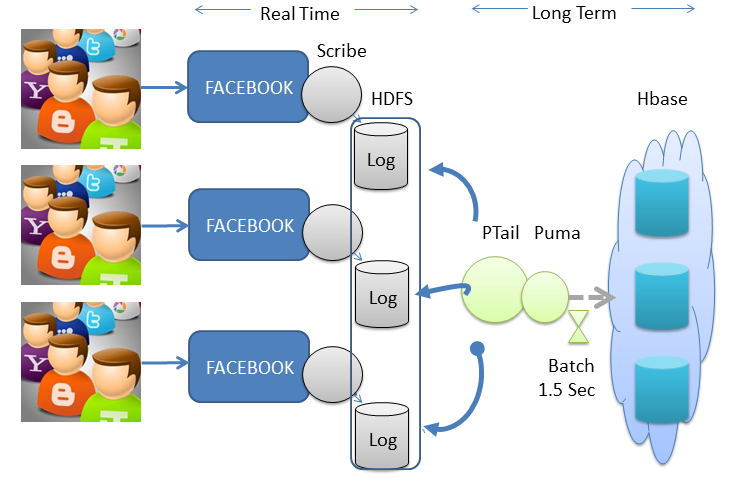 The stream is batched in 1.5 sec groupings by Puma which stores the event batch into HBase. The real time logs are kept for a certain period of time and than get cleared from the system. Obviously this description is a fairly simplistic view – the full details are provided in the original post. Facebook reasoning behind their technology evaluation seems acceptable for the most part, although there are some obvious concerns. (Facebook) felt in-memory counters, for reasons not explained, weren’t as accurate as other approaches. Even a 1% failure rate would be unacceptable. Analytics drive money so the counters have to be highly accurate. HBase seemed a better solution based on availability and the write rate. Write rate was the huge bottleneck being solved. Eric’s comment is indicative of how dynamic the NoSQL space is. I’d be interested in how different the technology selection would be now. Events logging needs to be extremely fast, to minimize the latency impact on the site. Events need to be reliable, otherwise the entire system’s accuracy is questionable and the data is devalued. Post processing can happens in batches, the size of the batch depends on how *real-time* we need this data to be. Writes to a backend database need to be done asynchronously. Facebook seem to follow those same principles in their architecture while keeping the system at scale at a fairly impressive rate. Are Ptail and Puma centralized components? If so, don’t they pose a potential bottleneck? Based on Todd’s summary and Alex’ presentation, it seems that the way Facebook scaled their system is by splitting the PTail stream by categories of events so each type can be handled by a different data center. Puma batches event logs in memory before it writes them into Hbase – what happens if Puma fails before the batch is written? Looking backward – wouldn’t it be better to store the data in-memory in the first place? Why add the extra architecture components, if you’re able to make memory work for you? This is a crucial question, of course, because it focuses attention on memory availability. As mentioned, though, there are in-memory data grids that are designed for just this kind of situation. What if this rate is lower than the actual write rate? After I initially commented I appear to have clicked on the -Notify me when new comments are added- checkbox and now whenever a comment is added I get 4 emails with the exact same comment.